Muhlenbergia capillaris, is a must have for the low maintenance garden. Enjoy the Pink Muhly Grass as a show stopping source of late-season color. 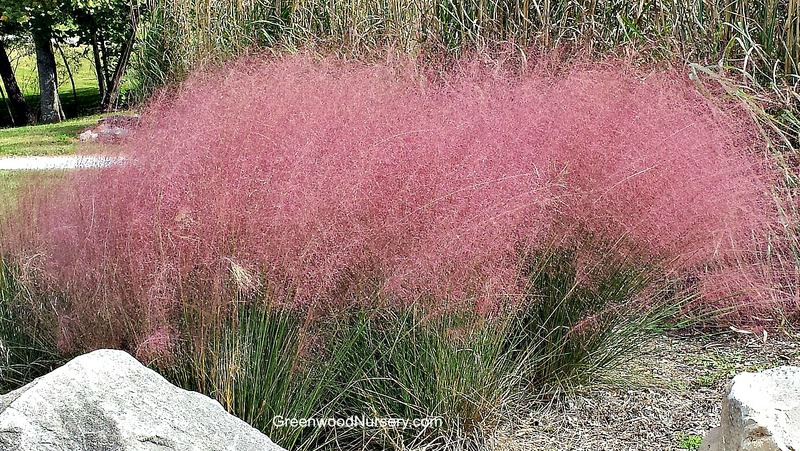 When summer is winding down and all the your summers annuals, flowering perennials and flowering shrubs are fading, your pink muhly grass with its giant puffs of cotton candy pink like plumes is just beginning its autumn dance of color. This ornamental grass makes a colorful hedge, border, and gorgeous in patio containers providing color from spring to summer, but when it bursts free with its gorgeous pink plumes that emerge from 4 foot stems, its sure to grab the show. Perfect for indoor arrangements, as they keep their color and texture beautifully outdoors as well, lasting through fall as the birds come to feast. The Pink Muhly reaches 4 feet high and 3 feet wide, with a nicely cascading, fountain habit of foliage and fanned-out, unbelievably profuse blooms. Give it plenty of sunshine and good soil drainage, and it will do the rest, beautifully withstanding heat, humidity, drought, and poor soil! Water plants as needed until they are established which is generally one year in the ground. Cut back to the ground in late winter to early spring before new grass blades begin. Fertilizer can also be applied if needed in spring. Needs to be in well drained soil and does well in hot dry sandy sites; very drought tolerant.